Groups of indigenous people in Brazil blocked roads and occupied government buildings to demand better healthcare for their communities. 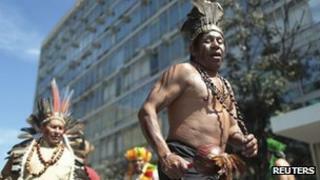 Several ethnic groups staged a protest at the Health Ministry building in the capital, Brasilia, asking for a meeting with a senior official. In a statement, the movement's leaders called for better facilities and access to more doctors. They say mortality rates are on the rise among the indigenous peoples. "The authorities promise a lot and do very little," said Pedro Kaingang, a spokesman for the group. He said urgent action is needed, starting by improving pay for doctors and other health workers who serve their communities. They also want better dental treatment, prescription glasses, wheelchairs and powder milk for infants. The ethnic groups who took part in the protest - Kaingang, Guarani and Charrua - come from the south of Brazil, where they also occupied government buildings. Arpinsul, the indigenous organisation behind the actions, says roads were blocked for several hours in the southern states of Rio Grande do Sul, Santa Catarina and Parana.